This 9x13 dish is great for lots of baking and roasting. It's the perfect size for a batch of these potatoes. 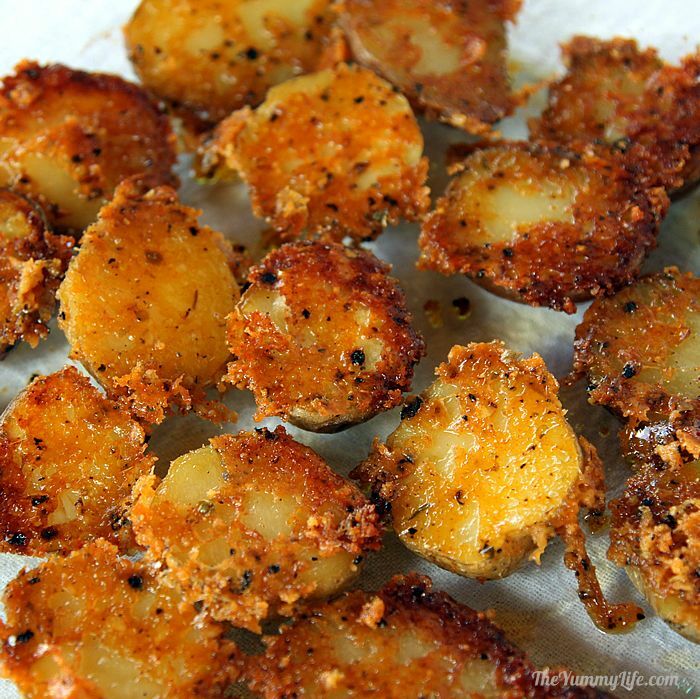 These crispy potatoes have amazing flavor and texture. They can prepared quickly for a dinner side, Game Day or party snack, or breakfast and brunch potatoes. In small bowl, combine grated cheese, garlic powder, paprika, oregano, salt, and pepper, stirring with fork until mixed. Pour olive oil into 9x13 glass baking dish. Tilt dish around until olive oil evenly coats entire bottom. 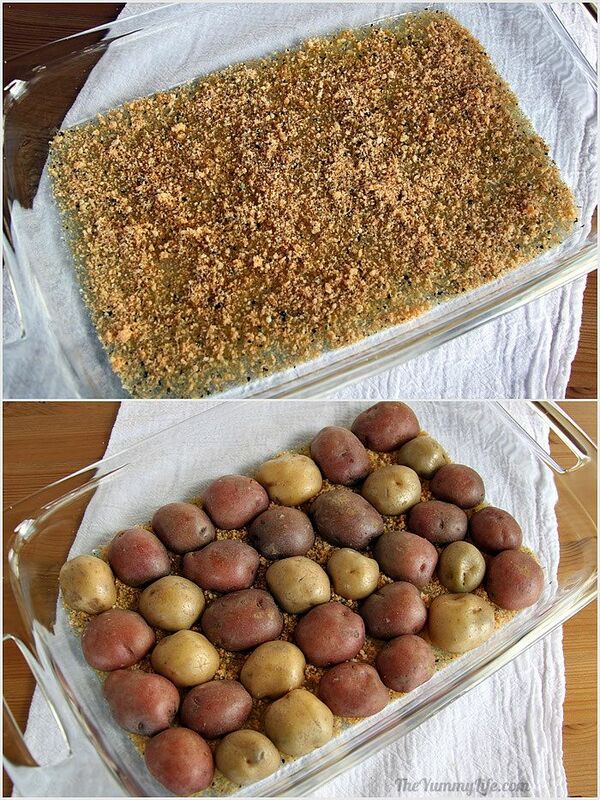 Arrange potatoes in a single layer, cut side down, on top of cheese mixture. Press down to insure potatoes are flat and in contact with cheese layer. Arrange on serving platter cheese side up. Serve with sour cream or Greek yogurt, (or a half-and-half mixture) sprinkled with chopped scallions or chives, if desired. TO REHEAT LEFTOVERS: Place potatoes cheese side up in a med-hot non-stick skillet to heat the bottom side. In 1-2 minutes, flip them over with tongs--cheesy side down--and cook another 1-2 minutes until heated and crispiness is restored. Be careful not to let them burn; they reheat quickly. NUTRITIONAL INFORMATION for one prepared potato (2 halves): 45 calories, 2.0g fat, .6g sat.fat, 2mg cholesterol, 118mg sodum, 142mg potassium, 5.6g carbs, .9g fiber, 1.5g protein. Since I first made these potatoes a few months ago, I've been making them at least once a week for my family. They are a happy combination of delicious, easy, and healthy. A crunchy, cheesy crust lends superior flavor and texture that everyone loves. As easy as it gets. Check out my photos below to see just how easy this recipe is. 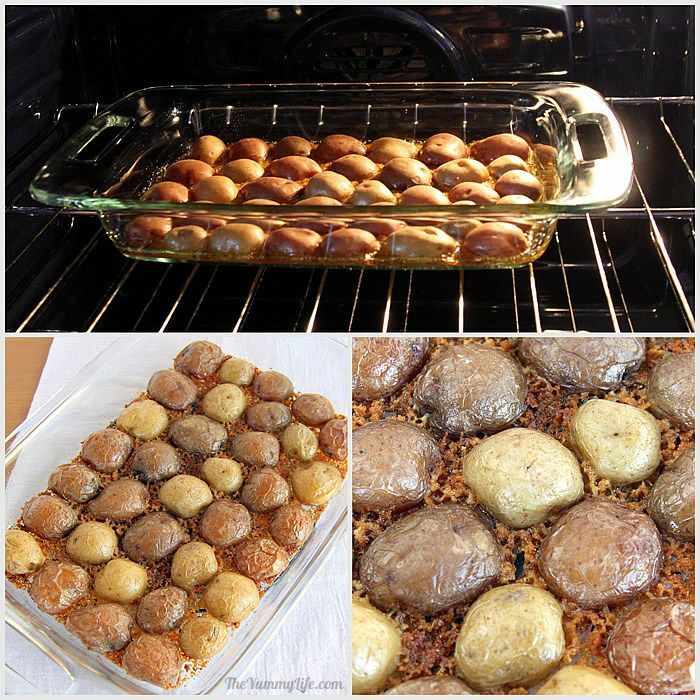 Add olive oil and seasoned Parmesan to the bottom of a baking dish, put halved baby potatoes on top, bake for 30 minutes--DONE! It's no wonder this has become our favorite potato recipe. This easy method has been around for years, and I can't be sure where it originated. There are similar potato recipes by Emily at Favorite Family Recipes, Ann at Fountain Avenue Kitchen, and Kraft. An old 2002 Gooseberry Patch cookbook calls them "Upside Down Baked Potatoes". 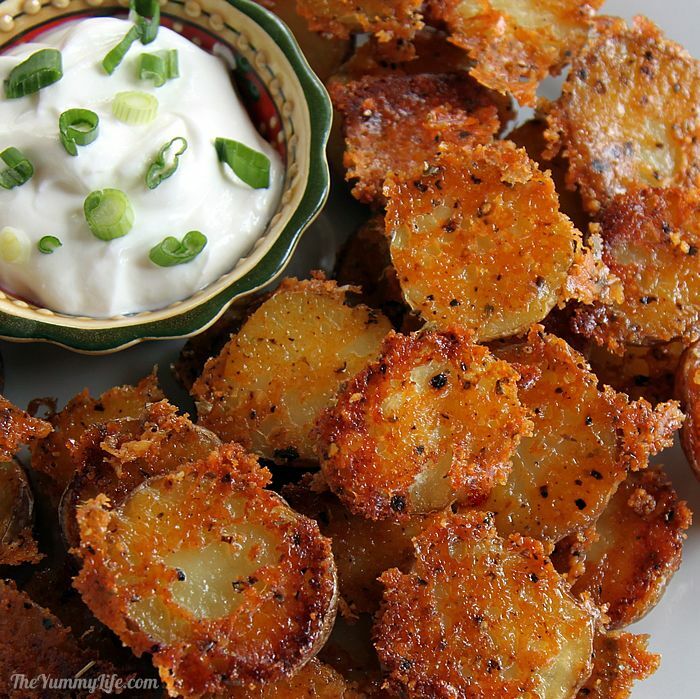 breakfast potatoes--better than hashbrowns and they're so much easier to make. A healthy recipe. Potatoes have had a bad rap because of their carbs. However, especially when eaten with the peel left on, the potato's complex carbs provide the body with fuel that is essential to muscle and brain health. 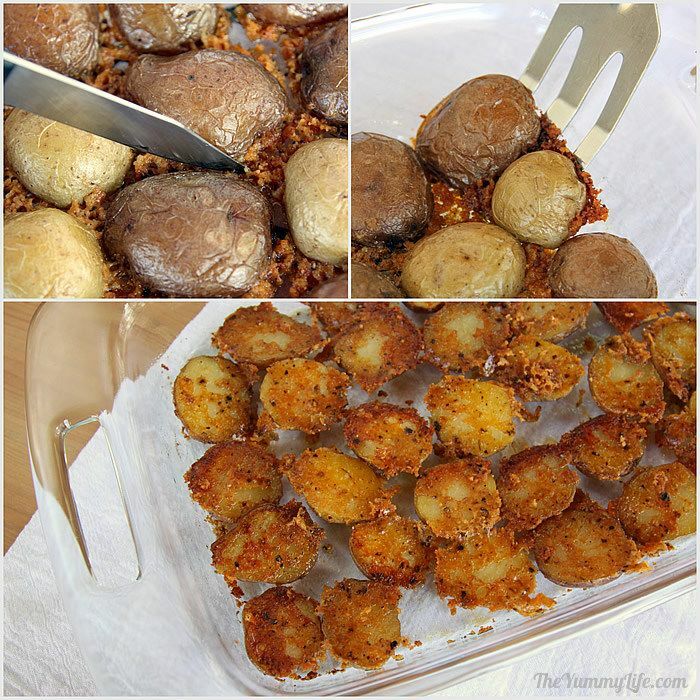 (source) These potatoes taste so rich and amazing, you'd never guess they turn out to be a diet-friendly recipe. Yay. Healthy olive oil is used in place of butter often found in other recipes using this method. The sodium count is on the high side in this recipe, but you can reduce or omit the added salt if that's a concern. Nutritional Information for one prepared baby potato (2 halves): 45 calories, 2.0g fat, .6g sat.fat, 2mg cholesterol, 118mg sodum, 142mg potassium, 5.6g carbs, .9g fiber, 1.5g protein. baby potatoes--these are also called "new potatoes"; they are sometimes available in red, purple and/or gold, so feel free to mix it up. I'm using red and gold in the photos below. Baby potatoes have a tender, creamy texture. finely grated (not shredded or Microplaned) Parmesan cheese; the kind with a sand consistency works best for forming a crust and sticking to the potatoes. The dried kind in the green can will work, but I prefer fresh grated cheese that comes in deli containers often found in the dairy or deli section of the grocery store. Or, you can grate your own in a food processor; here's how. You also need a few spices. 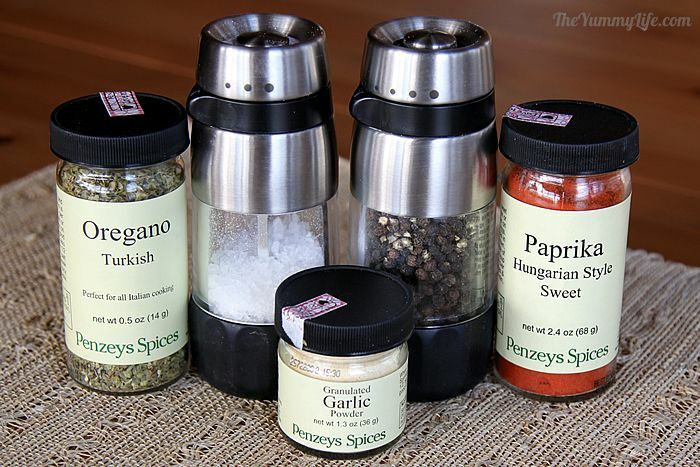 My favorite combo is salt, pepper, oregano, paprika, and garlic powder, but you can tweak the seasonings to suit your taste. In most other recipes, I prefer using fresh garlic; however I use garlic powder here, because fresh garlic will burn by the time the potatoes are cooked. Step 2. Cut each potato in half. Step 3. 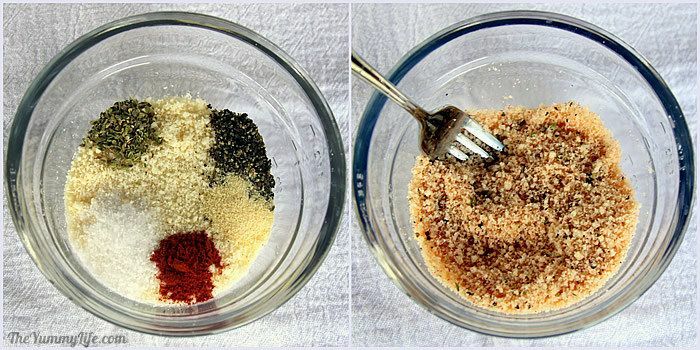 Stir together the grated Parmesan and seasonings. Step 4. Drizzle the olive oil into a 9x13 baking dish. Then tilt the pan from side-to-side until there is an even coat of oil on the entire bottom of the pan. Step 6. 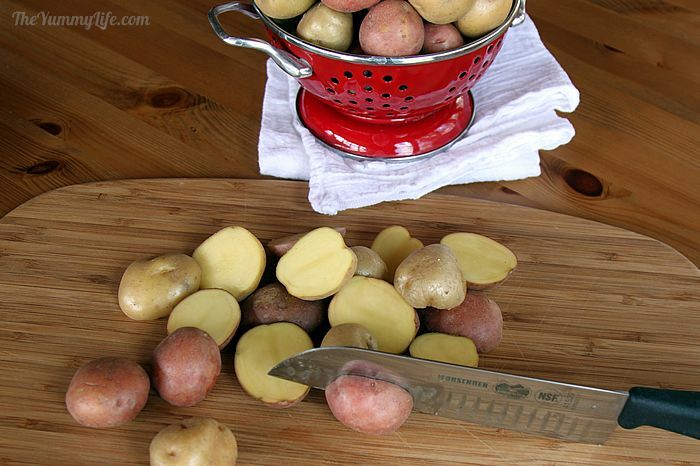 Place the potatoes in the pan in a single layer, cut side down. Press on them firmly to make sure the flat side of the potato is in contact with the cheese mixture on the bottom of the baking dish. Step 7. Bake for 30-40 minutes, until the cheese is browned and the potatoes are soft when pressed with your finger or pierced with a fork. Step 8. Once they're out of the oven, let the potatoes rest in the pan for 5 minutes before removing them. (This cooling off time sitting in the pan helps the crust stick to the potatoes.) Then gently slide a small spatula underneath each potato and turn them over. There should be a cheesy crust on top of the potato. As the cheese cools, it may be harder to separate the individual potatoes. If this happens, use a small paring knife to cut the cheese between the potatoes before lifting them up and over. So easy--right? 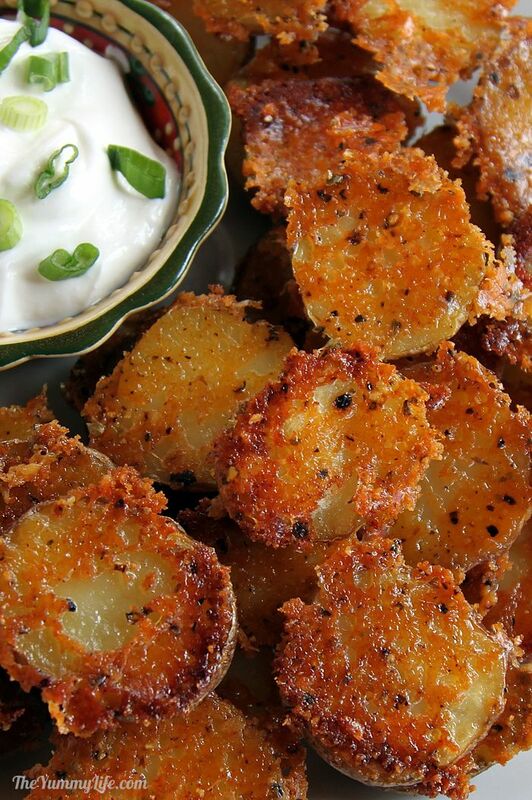 Those are some lip smackin' little potatoes. That crunchy, cheese crust is so amazingly tasty. Serve and dip! 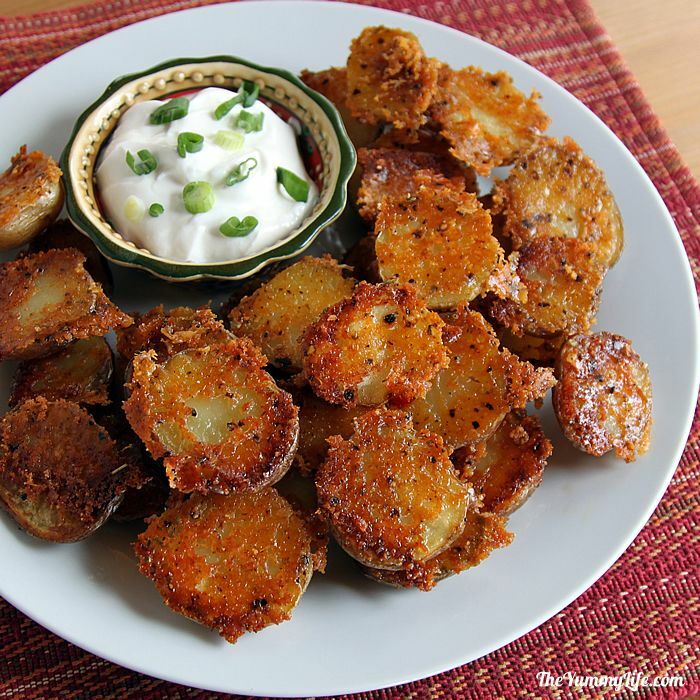 Arrange the potatoes on a plate with a bowl of sour cream or Greek yogurt for dipping. 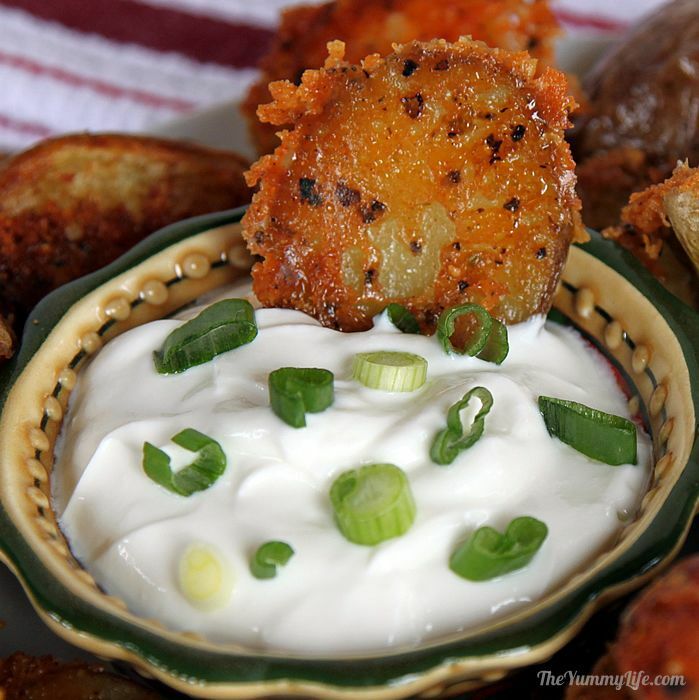 I like to make a 50-50 blend of sour cream and Greek yogurt sprinkled with chopped green onions or chives. How to reheat leftovers. (In the unlikely event that any are left, that is.) Place them cheese side up in a med-hot non-stick skillet to heat the bottom side. In 1-2 minutes, flip them over--cheesy side down--and cook another 1-2 minutes until heated and crispiness is restored. Be careful not to let them burn; they reheat quickly. OOPS ALERT! 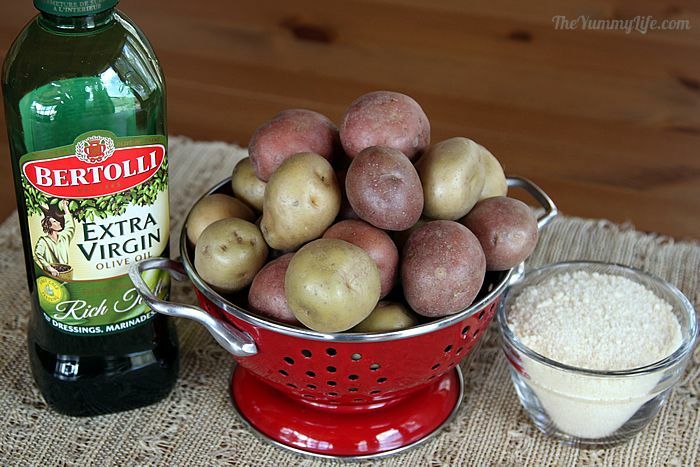 Don't try to prep the potatoes the day before, arrange them in the pan, refrigerate, and bake the next day. I tried it and the result was a total fail. Turns out the cut potatoes released a lot of liquid as they sat in the pan. When I baked them, they didn't develop that cheesy crust that is the whole point of this recipe. They were soggy and unappealing. Fortunately, this recipe is quick enough to prep that it's not a big deal to assemble the pan right before putting them in the oven. Lesson learned! These crusty, cheesy tators are simply the best and easiest potato recipe I've made. They'll continue to be in my regular rotation, that's for sure. Everyone loves them.